I do like raglan sleeve tops, so was keen to try the Amber blouse pattern bought recently from StyleArc. This top has all sorts of possibilities for colour blocking which usually has me pulling fabrics from nooks and crannies all aver my sewing room and ending up drowning in the pile with no idea what combination to use. This time I emerged from the fabric pile clutching this Japanese cotton print (a $10 remnant from Fabulous Fabrics) along with some brown knit fabric scraps that were quite a good match. The 80cm remnant piece was easily enough for the main fabric of the top. I decided to use white for the piping detail around the neckline and down the front panel. Rather than using real piping, I used 3cm wide strips of knit fabric folded in half with the raw edges matching the raw edge of the pattern piece. Once the 1cm wide seam allowance is folded under, 5mm of faux piping is visible. This method is super simple and reduces the bulk that normal piping would produce. I am kicking myself for not grading the seam allowances at the edges of the front and neckline panels. They are too thick making them very obvious. Bummer. I thought of it by the time I sewed the back neckline panel, which is covered by my hair. So annoyed! The front and neckline panels are interfaced and sewn on top of the main front pattern piece, so it would be easy to omit them and make a plain top for a change. 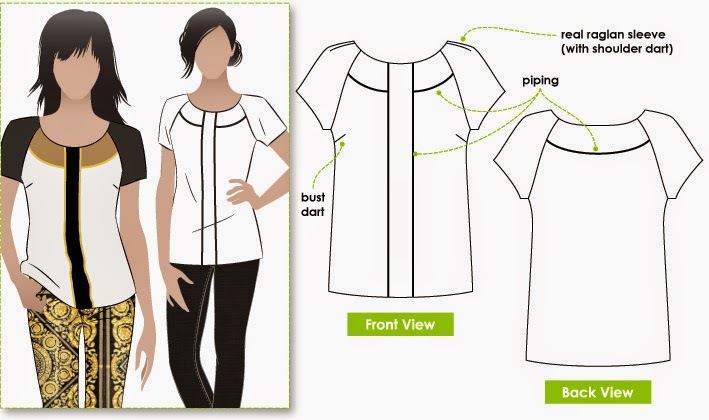 When the panels are included, the instructions have you sew the neckline edge with front and neckline piece right sides together to give a nice, clean finish to the neckline. The issue then is finishing the neckline edge of the sleeves. The pattern includes a little bias piece to do this, but I wasn't completely happy with the result. I wonder if a neater finish would be achieved using bias binding all the way around the neckline. Not sure. I am very happy with this top and will certainly be making more if I can only come up with another pleasing fabric combination. Since the colours in the top are not commonly found in my wardrobe, I realised that some new shorts would be required. I fancied white, but couldn't find exactly what I wanted in my stash. Having two boys home on school holidays has vastly restricted my access to fabric shops, much as I've tried to convince them of the virtues of such establishments. So, I pulled out a scrap of linen-look fabric from Remida. I only had a long strip so pieced the fabric together to have enough to cut the pattern pieces. I quite like the resulting seamlines across the back. I've made the Iris shorts a couple of times before so they went together quickly. The fabric was very unstable and kept pulling completely out of shape, but I got there in the end. Your top and shorts look great! You are right about the pleasing fabric combination. It is not a conventional mix of colours but it works! Very pretty colour combo! I always end up with piles of fabric lying around when I try to match fabrics. I also must do weird things with my eyes when matching as well, because I can't focus my eyes for hours afterwards. You look very summery in this outfit. Great combo of fabric for your top! Love it! You're lucky to be able to get sewing done at all during school holidays. I've had a bra on the go since before school finished up that I still haven't completed. Maybe this weekend? And I'm planning a fabric shopping trip before the holidays are over, with husband and children being pulled along kicking and screaming! This is a lovely outfit Megan. Great work sourcing all the fabrics from your stash. Love the fabric combinations and that flat piping makes the design lines really pop. I can see why you are loving the results. The neckline and sleeves on this top are so groovy. The shorts look fabulous on you. Great Summer outfit. I love the whole outfit. The fabrics you have made the top out of blend beautifully and the shorts are a perfect fit! 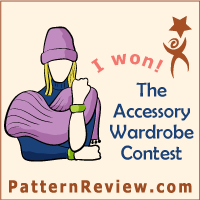 You did a great job - love the faux piping, especially! Darn you took a top pattern I don't like and made me want to make it! I love the way you combined the print and solid with the piping. Well done!